Use IRI Voracity or IRI NextForm DB Edition to discover, map, replicate, and load data in new target tables, while also being able to transform, mask, and report at the same time. Use the Offline Reorg wizard in IRI Workbench, which combines FACT, CoSort, and your DB's bulk load utility. Filter, sort, join, aggregate, reformat and otherwise transform and target table in multiple sources and formats in IRI Voracity workflow and transform mapping diagrams. 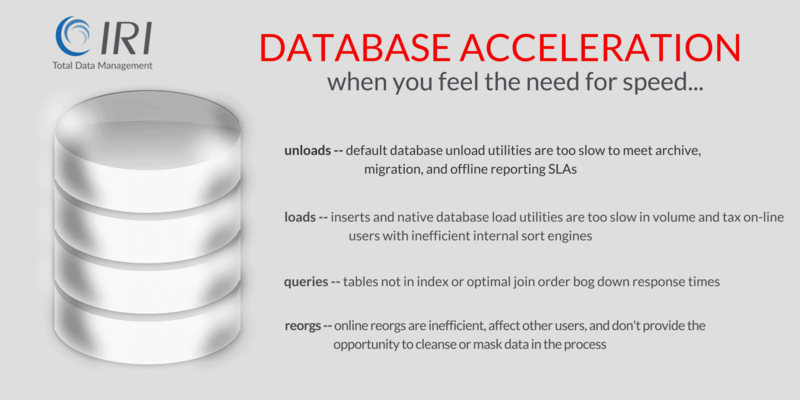 Accelerate Extracts for Faster ETL, Archive, Migration, etc. Use IRI FACT (Fast Extract) to parallel-unload tables to flat files via native drivers for Oracle, DB2, Sybase, SQL Server, MySQL, Altibase, Greenplum and Teradata. Reorder large tables in query order with IRI CoSort or the multi-table Offline Reorg wizard in the IRI Workbench GUI for Voracity, built on Eclipse™. Sort on the primary index key with CoSort or Voracity, pipe the results to SQL*Loader, DB2 Load, bcp, etc., and rebuilt the index later. Any product you license from IRI includes the free IRI Workbench GUI for all IRI products, built on Eclipse, which features multiple tools for data discovery in any JDBC-connected source. Protect PHI, PII, and other sensitive data in DB columns with data masking functions in Voracity or FieldShield. Set granular access control and SQL execution policies, monitor traffic without impacting the DB, and create query and report-ready audit logs with IRI Chakra Max alone or bundled with a Voracity subscription. Learn from our Total Data Management primer to plan for the creation and distribution of policy-driven, realistic test data sets. Use IRI RowGen or Voracity to automatically parse DDL, generate (and modify) the test data, and populate with pre-configured loader scripts. Use the DB subsetting wizard in the IRI Workbench GUI for Voracity.